War Horse is a 2011 war drama film directed and co-produced by Steven Spielberg from a screenplay written by Lee Hall and Richard Curtis, based on Michael Morpurgo's 1982 novel of the same name and its 2007 play adaptation. The film's ensemble cast includes Jeremy Irvine (in his film acting debut), Emily Watson, David Thewlis, Tom Hiddleston, Benedict Cumberbatch, Eddie Marsan, Niels Arestrup, Toby Kebbell, David Kross, and Peter Mullan. Set before and during World War I, it tells of the journey of Joey, a bay Thoroughbred horse raised by British teenager Albert (Irvine), as he is bought by the British Army, leading him to encounter numerous individuals and owners throughout Europe, all the while experiencing the tragedies of the war happening around him. DreamWorks Pictures acquired the film rights to the novel in December 2009, with Spielberg announced to direct the film in May 2010. Having directed many films set during the Second World War, it was his first film to tackle the events of World War I. Long-term Spielberg collaborators Janusz Kamiński, Michael Kahn, Rick Carter, and John Williams all worked on the film as cinematographer, editor, production designer, and music composer, respectively. Produced by DreamWorks Pictures and released worldwide by Touchstone Pictures, War Horse became a box-office success and was met with positive reviews. The film was nominated for six Academy Awards including Best Picture, two Golden Globe Awards and five BAFTAs. In 1912, a bay Thoroughbred is born in Devon, England. At auction, farmer Ted Narracott (Peter Mullan) outbids his landlord Lyons for the colt, to the dismay of his wife Rose (Emily Watson). Their son Albert (Jeremy Irvine), accompanied by his best friend Andrew, names the colt Joey, and teaches him to come when he imitates an owl's call. Against all odds, the horse and boy successfully plow a rocky field, saving the family's farm. Rose shows Albert his father's medals from the Second Boer War, and gives him Ted's regimental pennant, confiding in Albert that his father carries physical and mental scars from the war. In 1914, as war with Germany is declared, a heavy downpour ruins the family's crops, forcing Ted to sell Joey to the army. Captain James Nicholls (Tom Hiddleston) sees Albert's attachment and promises to look after the steed. Albert tries to enlist but is too young, and before the company departs, he ties his father's pennant to Joey's bridle. Joey bonds with Topthorn, a black horse with whom he is trained for his military role. The horses are deployed to Flanders with a flying column under the command of Nicholls and Major Jamie Stewart (Benedict Cumberbatch). They lead a cavalry charge through a German encampment, but the unit is mown down by machine gun fire. Nicholls is killed along with almost all his fellow cavalrymen; the Germans capture the horses. Gunther, a young German soldier, is assigned to the care of Joey and Topthorn. When his brother Michael is sent to the front line, Gunther takes the horses and the four of them desert. The German army soon tracks down the boys and they are shot for desertion; however, the Germans leave without noticing the horses. They are found by a French girl named Emilie. German soldiers arrive at her grandfather's farm, but Emilie hides the horses in her bedroom. For her birthday, Emilie's grandfather allows her to ride Joey; they run into the Germans, who confiscate the horses. Emilie's grandfather keeps the pennant. By 1918, Albert has enlisted and is fighting alongside Andrew in the Second Battle of the Somme. After a British charge into no man's land, Albert and Andrew miraculously make it across to the German trench, where a gas bomb explodes. The Germans use Joey and Topthorn to haul artillery, under the care of Private Henglemann. He eventually tries to free them, but Topthorn succumbs to exhaustion and dies. Joey escapes, narrowly evading an oncoming Mark IV tank, and gallops into no man's land where he becomes entangled in barbed wire. Colin, a British soldier, makes his way to Joey under a white flag and tries to free him. Peter, a German soldier, comes over with wire cutters, and together they rescue Joey and remark on the remorseless war. To decide who should take the horse, they flip a coin; Colin wins and guides the injured Joey to the British trench. Andrew is killed by the gas attack but Albert survives, temporarily blinded. While recuperating, he hears about the "miraculous horse" rescued from no-man's land. Just as Joey is about to be put down, he hears Albert's owl call. Albert, his eyes still bandaged, is able to describe Joey in perfect detail, and the two are reunited. World War I ends, and Joey is ordered to be auctioned. Though Albert's comrades raise a collection to bid for the horse, the auction is won by Emilie's grandfather, who tells Albert that Emilie has died and the horse is all he has left of her. However, the old man recognizes the strength of the soldier's bond, and returns the pennant and Joey to Albert, as "Emilie would have wanted." Albert returns with Joey to his family's farm, embracing his mother and returning the pennant to his father. The elder Narracott extends his hand to the boy, now a man and like him, a former soldier. Joey watches on, seemingly with pride. 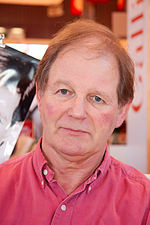 Michael Morpurgo, the author of the novel on which the film is based. Michael Morpurgo wrote the 1982 children's novel War Horse after meeting World War I veterans in the Devon village of Iddesleigh where he lived. One had been with the Devon Yeomanry and was involved with horses; another veteran in his village, Captain Budgett, was with the cavalry and told Morpurgo how he had confided all his hopes and fears to his horse. Both told him of the horrific conditions and loss of life, human and animal, during the Great War. A third man remembered the army coming to the village to buy horses for the war effort: horses were used for cavalry and as draught animals, pulling guns, ambulances and other vehicles. Morpurgo researched the subject further and learned that a million horses died on the British side; he extrapolated an overall figure of 10 million horse deaths on all sides. Of the million horses that were sent abroad from the U.K., only 62,000 returned, the rest dying in the war or slaughtered in France for meat. The Great War had a massive and indelible impact on the U.K.'s male population: 886,000 men died, one in eight of those who went to war, and 2% of the entire country's population. After observing a young boy with a stammer forming a fond relationship with and talking fluently to a horse at a farm run by Morpurgo's charity Farms for City Children, Morpurgo found a way to tell the story through the horse and its relations with the various people it meets before and during the course of the war: a young Devon farmboy, a British cavalry officer, a German soldier, and an old Frenchman and his granddaughter. Morpurgo tried to adapt the book into a film screenplay, working for over five years with Simon Channing-Williams, but in the end they had to admit defeat. The book was successfully adapted for a stage play by Nick Stafford in 2007. To work dramatically, the story could not be told solely through the horse's viewpoint (as it was in the book), and so the film version with a screenplay by Richard Curtis and Lee Hall is based on the narrative approach of the stage play more than that of the book. Unlike the play, which used puppet horses, the film uses a combination of real horses, animatronic horses and computer-generated imagery. "I won't kid you, it was more money [for the film rights] than I've ever been paid for anything I've ever written. But that wasn't the temptation. The temptation was the chance for an iconic film about the First World War, perhaps as great as All Quiet on the Western Front with its overpowering sense of waste." From 2006–2009, Morpurgo, Lee Hall and Revel Guest worked on a proposed film version of War Horse, which Morpurgo and Hall would write and Guest produce. Lack of finances meant that it was an informal arrangement, with the film rights not formally sold by Morpurgo to Guest's production company and no one being paid for the work they undertook. In 2009, film producer Kathleen Kennedy saw the critically acclaimed production of War Horse in London's West End with her husband, fellow producer Frank Marshall and their two daughters. They were very impressed by the story and Marshall has recalled how he was amazed that no one had already bought the film rights to the book. Steven Spielberg was told about War Horse by several people, including Kennedy, who was his colleague at Amblin Entertainment. After discussions with Revel Guest, it was announced on 16 December 2009 that DreamWorks had acquired the film rights to the book, with Spielberg stating: "From the moment I read Michael Morpurgo's novel War Horse, I knew this was a film I wanted DreamWorks to make … Its heart and its message provide a story that can be felt in every country." Spielberg saw the London production of the play on 1 February 2010 and met some of the cast afterwards. He admitted to being moved to tears by the performance. Hall commented that "Weirdly the week that we finished it [the screenplay], Spielberg expressed an interest, we sent him the script, and within a couple of weeks he'd decided he was going to make the film—it was one of those situations that never happens in the world of film." DreamWorks executive Stacey Snider suggested Richard Curtis to work on rewrites for the screenplay: she had worked with Curtis during her time at Universal Studios, and Curtis had previously written the World War I-set BBC comedy television series Blackadder Goes Forth along with Ben Elton which meant he was already familiar with the period. Spielberg was a fan of Blackadder but had never met Curtis. Curtis was initially reluctant to take part, but on meeting Spielberg they got on so well that Curtis rethought and committed to work on the script. Curtis has stated that the screenplay is closer to the book than the play, and that 'the existence of the play itself helped him "be brave" about his own adaptation.' Curtis produced more than a dozen drafts in three months, and has spoken of the close collaboration he had with Spielberg while working on the script. Having previously only been slated to produce the film, Spielberg decided to direct "the second I read [Curtis's] first draft. It happened faster than anything else we've [Spielberg and Snider] done together." It was announced that Spielberg was to direct the film on 3 May 2010; the cast was announced on 17 June 2010. Speaking at the Tribeca Film Festival in April 2011, actor Peter Mullan said that he took the part not just because Spielberg was directing, but also because of the 'beautiful script, really nice script'. According to an account of the book, play and film's development by Michael Morpurgo, within weeks of hearing from Kennedy about the London theatre production, Spielberg had "seen the play, met the cast, visited the Imperial War Museum and decided this would be his next film. In the weeks that followed he worked with Lee Hall and Richard Curtis on the script, and within months the film was being made". Spielberg was able to act so quickly because he was on a hiatus, waiting for the animation on his other 2011-released film, The Adventures of Tintin: The Secret of the Unicorn, to be completed. Spielberg has directed six films with World War II themes (1941, Raiders of the Lost Ark, Empire of the Sun, Indiana Jones and the Last Crusade, Schindler's List, and Saving Private Ryan), and has produced two others, Flags of Our Fathers and Letters from Iwo Jima, as well as producing two major television miniseries set during this period, Band of Brothers and The Pacific. In contrast, War Horse is Spielberg's first foray into World War I storytelling, as Spielberg admitted that prior to learning about the War Horse book and play "I had never been that interested in World War I". Kathleen Kennedy elaborated on the appeal of the story: "In cinema we've told very few stories about World War I and I think that's one of the things that attracted us to this … It's a forgotten war in the United States, and that had a very powerful effect on Steven and I [sic]." Dr. David Kenyon and Andrew Robertshaw of Battlefield Partnerships were military advisors on the film. After some speculation, the cast for War Horse was announced on 17 June 2010. It had been rumoured in the previous week that Eddie Redmayne had been cast in the lead part as Albert Narracott; however, relatively unknown stage actor Jeremy Irvine was chosen instead. Spielberg commented after seeing hundreds of young boys reading for the role, Irvine had come in and done a cold reading and that "his performance was very natural, very authentic." Irvine auditioned for two months, going in two or three times a week, and learned that he had the part when he was asked to read a piece of War Horse script on camera in order to check his West Country accent, and the piece of mocked-up script that he read out was Albert telling Joey that Steven Spielberg wanted him to play the part. The cast is European, with British, French and German actors playing characters of their respective nationalities. Robert Emms, who played the lead of Albert Narracott in the West End production of the play, was cast as David Lyons. Casting for extras took place in Devon in late July 2010. In all, some 5,800 extras were used in the film. The granddaughter of Captain Budgett, one of the World War I veterans who had inspired Morpurgo to write the story, acted as an extra in scenes filmed in Castle Combe, and Morpurgo himself filmed a cameo role there, along with his wife Clare. Prior to the start of filming, some of the actors underwent two months of intensive horse training. 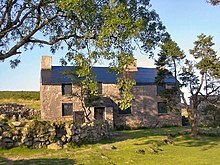 Ditsworthy Warren House on Dartmoor, which served as the Narracott family farmhouse in the film. Spielberg films are renowned for the levels of secrecy and security during filming, and this was no exception: filming took place under the codename Dartmoor. The filming period took 'about 64 days' in total. Filming of War Horse began with the cavalry scenes being filmed at Stratfield Saye House in north Hampshire, the estate of the Duke of Wellington, where incidentally Wellington's war horse Copenhagen is buried. Here a cavalry charge involving 130 extras was filmed. Filming on location on Dartmoor, Devon started in August 2010. Initially, Spielberg was only going to have four or five days' worth of second unit material shot in Devon, but after Kathleen Kennedy sent him photographs of the various locations she had scouted, he decided to cut other elements of the story to enable more filming to take place in countryside that Kennedy described as "so extraordinarily beautiful and absolutely perfect for the story". Dartmoor locations included the small villages of Meavy and Sheepstor, Burrator Reservoir, Bonehill Rocks and surrounding area near Widecombe-in-the-Moor, Ringmoor Down, Combestone Tor and surrounding area, Haytor, Hexworthy Bridge and Cadover Bridge/Brisworthy. Ditsworthy Warren House, an isolated Grade II listed building near Sheepstor on Dartmoor served as the Narracott family's farmhouse, and many scenes were filmed in the surrounding area. On 11 September 2010, the annual Dartmoor Yomp was re-routed to allow filming to continue undisturbed. Spielberg praised the Dartmoor countryside's beauty: "I have never before, in my long and eclectic career, been gifted with such an abundance of natural beauty as I experienced filming War Horse on Dartmoor… And, with two-and-a-half weeks of extensive coverage of landscapes and skies, I hardly scratched the surface of the visual opportunities that were offered to me." Spielberg felt that the landscape was very much a character in the film. Castle Combe in Wiltshire, another filming location. Although Devon rural locations were used, scenes in the main village in the story were filmed at the Wiltshire village of Castle Combe near Chippenham, despite the vernacular architecture of Devon (predominantly cob walls and thatched roofs) being very different from that of Wiltshire (stone walls and stone tiled roofs). Filming began there on 21 September 2010 and continued until 1 October 2010. Some residents of Castle Combe were angered by the imposition of tightened security within the village, claiming they could not enter the village without waiting at perimeter barriers until breaks in filming. After Castle Combe, the production moved on to Wisley Airfield in Surrey, where no man's land battlefield scenes were filmed. Shooting of wartime camp scenes also took place for about two weeks from 4 October 2010 at Bourne Wood near Farnham in Surrey, a frequent location for filming. On 13–14 October 2010, scenes were shot at the stately home Luton Hoo. Filming was also scheduled to be undertaken at Caerwent in Wales. Studio filming was undertaken at Longcross Studios, Chertsey in Surrey and at Twickenham Film Studios. The film shoot was completed in the last week of October 2010, with the entire film, French scenes included, being shot in the U.K., apart from some pick-up shots of a bay foal filmed in March 2011 in California. "The Michael Morpurgo book is ‘Black Beauty goes to war’. So if you’re English, two of the most emotive subjects you could touch on are Black Beauty and the First World War. The crew were constantly in tears, as there were war memorials and everybody had a story in their family ... for English people, everyone is touched by that war." –Emily Watson on World War I's enduring emotional legacy. Michael Morpurgo, the author of the book on which the film is based, visited the set several times while filming was being undertaken: "Spielberg's a wonderful storyteller and a kid. He adores stories and that's what he's best at. It's extraordinary to meet someone with that kind of enthusiasm, utterly unspoiled … When I went to visit him on set, he was clearly enthralled by the countryside. He fell for Devon in a big way. He was warm, kind and open, and utterly without ego … Spielberg was like a conductor with a very light baton. He hardly had to wave it at all. I was in awe." Emily Watson also praised Spielberg's approach: "It was intimate, passionate and about the acting. And every single priority that as an actor that you would want to be there was there. It felt very real and focused." On set, he'd come in, in the morning, and say, 'I couldn't sleep last night. I was worrying about this shot!' Which was great! He's human and he's still working in an impassioned way, like a 21-year-old, trying to make the best out of everything." 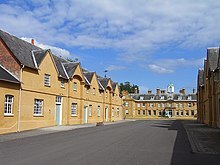 The coachhouses and stable blocks at Stratfield Saye House in Berkshire, where some scenes were filmed. For lead actor Jeremy Irvine, starring in his first film role, the filming process was intense at times, in particular the scene where the British cavalry, 130 horses in total and many hundreds of extras, charged the German machine gun lines. He explained: "It's the weapons of the old world—our men on horses—meeting the absolute destruction of these tools of mass slaughter. There was this line of machine guns and there's this wall of lead coming out of these guns. There were real explosions at my feet, bodies flying through the air, stunt men getting shot at. It was terrifying. The smoke and the smell and the taste of the guns firing. It's not difficult to act scared in that situation. There's no doubt this was deliberate: not only to have the film look great, but to have that effect on the actors. It was an eye-opening scene." When actor Peter Mullan won the award for Best Film at the San Sebastián International Film Festival in Spain for Neds, the film he wrote, directed and in which he acted, Spielberg insisted that Mullan should attend the ceremony on 26 September 2010 to accept his award in person, and re-arranged the War Horse shooting schedule accordingly. Spielberg commented on how he and cinematographer Janusz Kamiński developed the 'look' of the film: "…it doesn't feel like Ryan at all … it has a much more daguerrotype feel, much more brownish. We're not using any of the techniques we used on Ryan. The only similarity is that it is war and it is handheld." "When I'm on an Indy movie, I'm watching Indiana Jones, not the horse he is riding ... Suddenly I'm faced with the challenge of making a movie where I not only had to watch the horse, I had to compel the audience to watch it along with me. I had to pay attention to what it was doing and understand its feelings. It was a whole new experience for me." The pre-production period only allowed for three months to train the horses before shooting commenced. The main horse trainer was Bobby Lovgren, and other horse trainers included Dylan Jones, Bill Lawrence, and Zelie Bullen. During filming, fourteen different horses were used as the main horse character Joey, eight of them portraying him as an adult animal, four as a colt and two as a foal; four horses played the other main equine character, Topthorn. Up to 280 horses were used in a single scene. A farrier was on set to replace horseshoes sucked off in the mud during filming, and the horses playing the main horse characters had a specialist equine make-up team, with their coats dyed and markings added to ensure continuity. Equine artist Ali Bannister was responsible for the 'hair and make-up' of the horses, as well as drawing the sketches of horses that are featured in the film. Extra filming involving a bay foal took place in California in March 2011. Working with horses on this scale was a new experience for Spielberg, who commented: "The horses were an extraordinary experience for me, because several members of my family ride. I was really amazed at how expressive horses are and how much they can show what they're feeling." Representatives of the American Humane Association were on set at all times to ensure the health and safety of all animals involved, and the Association awarded the film an "outstanding" rating for the care that was taken of all the animals during the production. However, a 2013 suit by former AHA employee Barbara Casey alleges that a horse was killed on set, but the organisation chose to "cover-up the death" to protect Spielberg's reputation. An animatronic horse was used for some parts of the scenes where Joey is trapped in barbed wire; the wire was rubber prop wire. Film editor Michael Kahn spoke of his work on the film: "We have some shots in War Horse that are just fantastic … We shot it in Devon, and you know it's gorgeous down there, and the horses are beautiful and the farms are beautiful, beautiful scenery and every shot is gorgeous, and eventually you get to the war part of it and it's really, really something." Kahn had a trailer on set and edited the film during filming. Kahn and Spielberg cut the film digitally on an Avid, rather than on film, a first time with this technology for Spielberg: "He decided that he'd like to try it", Kahn commented. After filming, further editing was undertaken at the U.K.'s Twickenham Film Studios, with the production moving back to the U.S. in November 2010. Kahn also said of his work on the film: "We put together here in Hollywood. It worked well … Those English actors are awfully good and so were the horses. The horses were beautifully trained. For an editor there were a lot of match [frame] problems with the horses but the shooting was so good that I got everything I needed." The film score by John Williams was recorded in late March and early April 2011. Tuba player Jim Self reported in May 2011: "For John Williams I [sic] recently finished recording for the film War Horse. It's a war movie so the score has a lot of brass—but it was gentle music often." English folk singer John Tams, who wrote the songs for the stage production of War Horse, was approached by Spielberg and Williams about including one of his songs from the stageshow in the film. In the liner notes to the film soundtrack CD, Spielberg wrote "I feel that John has made a special gift to me of this music, which was inspired not only by my film but also by many of the picturesque settings of the poet William Wordsworth, whose vivid descriptions of the British landscape inspired much of what you are going to hear." In the premiere of three of the tracks on New York radio station WQXR's "Movies on the Radio", broadcaster David Garland drew parallels with the work of British composer Ralph Vaughan Williams. Visual effects for the film were undertaken by London-based company Framestore. According to Spielberg, the film's only digital effects are three shots lasting three seconds, which were undertaken to ensure the safety of the horse involved: "That's the thing I'm most proud of. Everything you see on screen really happened." Kathleen Kennedy elaborated, stating "We really did it very naturalistically. There isn't a lot of blood. Steven wasn't interested in bringing Private Ryan into it, but we did want to make a PG-13 movie." Actor Tom Hiddleston said of the film that Spielberg had "seen the stage play and he wanted to retain the magic and heartbeat of that … It's a moving, powerful story you can take children to see, but it is still very upsetting … People die, and it is war." John Williams composed and conducted the film's musical score, the second score composed the same year by Williams for Spielberg after The Adventures of Tintin. Williams took inspiration by visiting a horse farm in California and observing horses and their behavior, elaborating that "I got in the habit of watching the horses in the morning, and I began to see how they connect to each other and how they became curious about me. That's when I really began to get the sense that horses are very special creatures. They have been magnificent and trusted friends for such a long time and have done so much for us with such grace." Williams was also influenced by the geographic scope of the film's story. In regards to that approach, Williams stated; "This was a very rich opportunity musically because it is both about humans and animals and it takes place in three different countries. It starts out in a more intimate way, on the farm with the bonding of Joey and Albert. Then, the eruption of war changes the scale, and the music does a 180-degree turn. From this bucolic, gentle, even sentimental music, you move into the music of battle surges and gripping struggles. It's a musical journey full of dimension and emotional content, and I tried also to create an atmosphere reflective of that period, which was lyrical, poetic and tragic." The score was recorded by a 90-piece orchestra, with Williams comparing the recording sessions more to a concert piece rather than a traditional film score, as it relied more on the individual performance of the musicians. All music composed by John Williams. "To round out the year, Steven Spielberg's War Horse appears in time for the festive period. If you're thinking that nothing says Christmas like the bloody trench warfare carnage, you may be in luck. 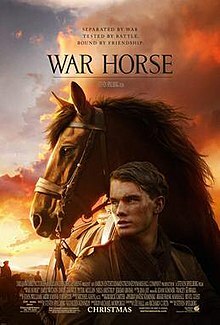 But while Spielberg isn't one to sugarcoat the horrors of war, he's just the director to fill this Great War-set story of a boy and his horse with saddlebags of heart and soul. We can't wait to see how he's brought the colossally popular stage play to the big screen." War Horse was released in North America by Walt Disney Studios Motion Pictures through its Touchstone Pictures label on December 25, 2011. The film marked the first Spielberg-directed film to be distributed by Walt Disney Studios. The release date for America was originally set for 10 August 2011, but after a meeting in London in early October 2010 between DreamWorks and Disney executives, when some footage was screened, the decision was taken to move its release to 28 December 2011 in the holiday period, and in the U.K. on 13 January 2012. DreamWorks executive Stacey Snider said: "The reaction to the footage—which he [Spielberg] usually never shows—was that it feels like a big, holiday movie … It just became inevitable that we would move it. (Spielberg) feels great about it." In late September 2011, Disney moved the release date again, to Christmas Day 2011. Only a very few unofficial on-set photographs and clips of video footage were published in the press and online during the filming period. Due to the usual embargo on photographs and videos being taken and made public during Spielberg shoots, very few photographs emerged, with the majority being snatched paparazzi shots. In October 2010 Spielberg's cinematographer on the film, Janusz Kamiński, put an on-set photograph of himself on a battlefield set on his Facebook page. The first ten official photographs were made public by DreamWorks in several releases between 11 and 14 March 2011, in Empire magazine, in an article in the Daily Mail and in an article in Entertainment Weekly. On 16 March 2011 a British blogger published an account of her unofficial visit to the War Horse set at Ditsworthy Warren House, and despite the security on-set, was able to take photographs of the set's interior and of Steven Spielberg. On 29 March 2011, DreamWorks presented behind-the-scenes footage, introduced on film by Spielberg, to theatre owners at CinemaCon in Las Vegas. Spielberg was unable to attend in person as he was still working on the film's post-production. On 29 June 2011, the film's first official teaser trailer was released, and the official website was launched. On its launch, the website was rather a sparse affair, with just the official trailer and synopsis, and only two of the ten previously-released official photographs. Further footage, introduced on film by Spielberg, was shown at the Empire magazine 'Big Screen' event in London in August 2011. Jeremy Irvine talked about his experiences making the film at the same event. The full theatrical trailer was released on 4 October 2011, and more on-set photographs were released on 17 November 2011. "The film feels like a Christmas present, [Morpurgo] says—one he desperately wants to open but isn't allowed to yet. If that sounds almost childlike, so does the quality of his anticipation: 'I know I've built up my hopes considerably ... I want it to live on and on in people's minds'." The publicity strategy for War Horse unusually featured preview screenings for the public in U.S. heartland areas before either the critics were shown the film or it was screened to the public in major metropolitan areas. The first preview screenings of War Horse were held at various locations across the U.S. on 1, 2 and 10 November 2011. Military veterans in Canada were invited to seven different screenings on 16 November, in honour of Remembrance Day, five days earlier. More preview screenings in the U.S. took place on 27 November, with Spielberg attending a question and answer session at the New York screening that was beamed to the other screening cinemas and shown live on the internet. Press screenings for critics were first held in New York and Los Angeles on Thanksgiving Day, 24 November 2011, although there was an embargo on official reviews being published at that time. On 27 November, there was a special screening in London for the crew and cast, the first time anyone involved with the film (apart from Spielberg and his close collaborators) had seen it. Three television advertisements for the film were released in the U.S. on Thanksgiving Day, 24 November 2011, shortly followed by others. The film's world premiere was held on Sunday 4 December at the Avery Fisher Hall of New York City's Lincoln Center, where the Tony award-winning Broadway production of War Horse was playing in the neighbouring Vivian Beaumont Theater. The U.K. premiere took place in London's Leicester Square on 8 January 2012, and was attended by Prince William, Duke of Cambridge and his wife Catherine, Duchess of Cambridge. A tie-in book by Steven Spielberg, titled War Horse, was published by Harper Collins on 27 December 2011. In the old school they use now for the Village Hall, below the clock that has stood always at one minute past ten, hangs a small dusty painting of a horse. He stands, a splendid red bay with a remarkable white cross emblazoned on his forehead and with four perfectly matched white socks. He looks wistfully out of the picture, his ears pricked forward, his head turned as if he has just noticed us standing there. Painted by Captain James Nicholls, autumn 1914. Bannister's commissioned portrait was hung in the Iddesleigh Town Hall in part response to the reported tourists who had previously sought out the (fictional) portrait. War Horse was released on Blu-ray Disc, DVD, and digital download on 3 April 2012 from Touchstone Home Entertainment. The release was produced in three different physical packages: a 4-disc combo pack (2-disc Blu-ray, DVD, and Digital Copy); a 2-disc combo pack (Blu-ray and DVD); and a 1-disc DVD. The film was released digitally through on-demand services such as the "iTunes Store" in high and standard definitions. The 1-disc DVD includes the bonus feature "'War Horse': The Look" and the digital versions come with "An Extra's Point of View." The 2-disc combo pack includes "'War Horse': The Look" and "An Extra's Point of View" bonus features. The 4-disc combo pack comes with the same extras as the 2-disc combo pack, as well as "A Filmmaking Journey," "Editing & Scoring," "The Sounds of 'War Horse,'" and "Through the Producer's Lens" bonus features. Based on 218 reviews collected by Rotten Tomatoes, War Horse received a 76% "Certified Fresh" approval rating from critics with an average score of 7/10. The site's critical consensus is "Technically superb, proudly sentimental, and unabashedly old-fashioned, War Horse is an emotional drama that tugs the heartstrings with Spielberg's customary flair." Although there was an embargo on official reviews of the film being published before 21 December 2011, reviews started appearing from 26 November 2011 onwards in mainstream press such as The Daily Telegraph, which gave it 4½ out of 5 stars. Giving the film an A- grade, Lisa Schwarzbaum of Entertainment Weekly wrote, "The project is tailor-made for Saving Private Ryan Spielberg, the war-story specialist, as well as for E.T. Spielberg, the chronicler of boyhood desires and yearnings for family." Christopher Tookey of Daily Mail gave the film 5 out of 5 stars and called it "Spielberg's finest hour". Rex Reed of The New York Observer gave the film 4 out of 4 stars and said, "War Horse is a don't-miss Spielberg classic that reaches true perfection. It's as good as movies can get, and one of the greatest triumphs of this or any other year." Roger Ebert gave the film 3.5 out of 4 stars, saying the film contained "surely some of the best footage Spielberg has ever directed". He wrote, "The film is made with superb artistry. Spielberg is the master of an awesome canvas. Most people will enjoy it, as I did." Richard Roeper praised War Horse by saying, "What a gorgeous, breathtaking, epic adventure this is." He gave the film 4.5 out of 5 stars. Ty Burr of The Boston Globe said that the film was a work of full-throated Hollywood classicism that looks back to the craftsmanship and sentimentality of John Ford and other legends of the studio era. He gave it 3 out of 4 stars. The film also made many critics' top film lists of 2011. Richard Corliss of Time named it 2011's fifth-best film, saying "Boldly emotional, nakedly heartfelt, War Horse will leave only the stoniest hearts untouched". David Chen of /Film selected War Horse as 2011's best film. In The Guardian, Simon Winder wrote that the film, "despite twisting and turning to be even-handed, simply could not help itself and, like some faux-reformed alcoholic, gorged itself on an entire miniature liqueur selection of Anglo-German clichés". David Denby of The New Yorker wrote about the film that "The horses themselves are magnificent, and maybe that's reason enough to see the movie. But War Horse is a bland, bizarrely unimaginative piece of work". The soundtrack recording by John Williams received a Sammy Award for Best New Film Score CD. War Horse grossed $79,859,441 domestically and $97,200,000 overseas, for a worldwide total of $177,584,879. Although not one of Spielberg's biggest box office successes, it was the highest-grossing World War I film of all time until Wonder Woman, five years later. ^ "War Horse (12A)". British Board of Film Classification. Retrieved 3 December 2011. ^ a b c "War Horse". Box Office Mojo. Los Angeles. Retrieved 17 April 2012. ^ a b c Freer, Ian (17 February 2010). "Exclusive: War Horse Cast Announced". Empire. Retrieved 4 February 2011. ^ "Steven Spielberg announces War Horse cast". BBC News Online. 18 June 2010. Retrieved 27 February 2011. ^ a b "War Horse". Rotten Tomatoes. Retrieved 23 August 2016. ^ "Commonwealth War Graves Commission Annual Report 2007–2008 Online". Cwgc.org. Retrieved 13 June 2011. ^ a b Morpurgo, Michael (11 July 2010). "Once upon a life: Michael Morpurgo". The Guardian. London. Retrieved 8 March 2011. ^ a b c d e Morpurgo, Michael (23 February 2011). "How my War Horse won its spurs with Steven Spielberg". Daily Mail. London. Retrieved 20 February 2011. ^ Morpurgo, Michael (31 March 2009). "Morpurgo: War Horse is a story I had to write". Evening Standard. London. Archived from the original on 10 January 2012. Retrieved 8 March 2011. ^ Morpurgo, Michael (21 August 2010). "Adapt and survive". The Guardian. London. Retrieved 8 March 2011. ^ a b "Four More Images & Press Release For Steven Spielberg's 'War Horse'". www.flicksandbits.com. 11 March 2011. Archived from the original on 15 March 2011. Retrieved 9 May 2011. ^ a b c d e Bamigboye, Baz (11 March 2011). "The theatrical dark horse who found himself picked for an epic movie". The Daily Mail. London. Retrieved 11 March 2011. ^ a b Hogg, Trevor (23 February 2011). "Cutting Edge: A conversation with film editor Michael Kahn". Flickering Myth. Archived from the original on 23 July 2012. Retrieved 27 February 2011. ^ a b Lowe, Jeff (10 March 2011). "Foal from Oklahoma gets a part in Spielberg's War Horse". Thoroughbred Times. Retrieved 10 March 2011. ^ Gore-Langton, Robert (27 July 2010). "Michael Morpurgo on his sequel to War Horse". The Daily Telegraph. London. Retrieved 8 March 2011. ^ Guest, Revel (2 December 2011). "Steven Spielberg's War Horse: from page to screen". The Daily Telegraph. London. Retrieved 2 December 2011. ^ "Horse lover Revel Guest helped War Horse film". BBC. 3 January 2012. Retrieved 5 January 2012. ^ Rowat, Alison (5 August 2010). "Legend in his own lunchtime". The Herald. Glasgow. Retrieved 10 May 2011. ^ a b Wadham, Jo (28 February 2011). "Interview with author Michael Morpurgo". The National. Abu Dhabi. Retrieved 8 March 2011. ^ a b Heyman, Marshall (7 April 2011). "Dining Out With Britain's Emergent Equine". The Wall Street Journal. New York. Retrieved 9 May 2011. ^ Fernandez, Jay A. (16 December 2009). "DreamWorks goes to 'War'". The Hollywood Reporter. Los Angeles. Retrieved 6 April 2011. ^ Bannerman, Lucy (22 December 2009). "Theatre hit heads for Hollywood as Steven Spielberg buys War Horse rights". The Times. London. Retrieved 27 February 2011. ^ Jury, Louise; Dominiczak, Peter (2 February 2010). "Spielberg sees War Horse after buying the film rights". The Evening Standard. London. Archived from the original on 1 September 2010. Retrieved 6 April 2011. ^ Rycroft, William (2 February 2010). "War Horse - The view from onstage (Blog by actor in War Horse London stage play)". Just William's Luck. Retrieved 8 May 2011. ^ "War Horse: A Man's Play". Blokely. 3 December 2010. Retrieved 1 July 2011. ^ a b Phillips, Michael (5 November 2011). "Steven Spielberg and 'War Horse': Kindred spirits". Chicago Tribune. Chicago. Retrieved 5 November 2011. ^ a b Mansfield, Susan (27 July 2011). "Interview: Lee Hall, playwright". The Scotsman. Edinburgh. Retrieved 29 July 2011. ^ Dawn, Randee (17 November 2011). "Born on Broadway isn't a sure pedigree". Los Angeles Times. Los Angeles. Retrieved 17 November 2011. ^ a b c d e Galloway, Stephen (2 December 2011). "'War Horse': The Making of Steven Spielberg's WWI Epic". The Hollywood Reporter. Los Angeles. Retrieved 3 December 2011. ^ Curtis, Richard (22 December 2011). "Richard Curtis: Steven Spielberg took me on ride of my life". Evening Standard. Archived from the original on 23 July 2012. Retrieved 22 December 2011. ^ Rosen, Christopher (9 December 2011). "Richard Curtis on 'War Horse,' Working With Steven Spielberg and the Prescience of 'Love Actually'". moviefone.com. Archived from the original on 23 July 2012. Retrieved 10 December 2011. ^ Newcomb, Peter (25 February 2011). "The Auteur and the Executive". Wall Street Journal. New York. Retrieved 27 February 2011. ^ McClintock, Pamela (3 May 2010). "Spielberg rides with 'War Horse'". Variety. Los Angeles. Retrieved 6 April 2011. ^ DiGiovanna, Alex (2 May 2011). "Tribeca Film Festival '11: Interview with Peter Mullen, Director/Writer/Co-Star of 'Neds'". Movie Buzzers. Archived from the original on 23 July 2012. Retrieved 5 May 2011. ^ Leins, Jeff (4 May 2010). "Steven Spielberg's Next Film is 'War Horse'". News In Film. Retrieved 16 May 2011. ^ Brook, Tom (13 June 2010). "How War Horse took on the world". BBC online. Retrieved 13 June 2011. ^ Moss, Richard (6 July 2010). "War Horse heads to English Heritage Festival of History for dramatic World War I trench recreation". Culture 24. Retrieved 7 July 2011. ^ "History group starring in Steven Spielberg blockbuster take part in annual Kelmarsh festival". Northampton Chronicle. 15 June 2010. Retrieved 16 June 2011. ^ "Dr David Kenyon". Battlefield Partnerships. Archived from the original on 5 September 2011. Retrieved 16 June 2011. ^ "Andy Robertshaw". Battlefield Partnerships. Archived from the original on 5 September 2011. Retrieved 16 June 2011. ^ Tyler, Mathew (10 June 2010). "Spielberg Casts Eddie Redmayne As 'War Horse' Lead". Thefilmstage.com. Archived from the original on 19 August 2010. Retrieved 9 May 2011. ^ a b "War Horse Jeremy Irvine Interview". LSQTV.com. 16 August 2011. Retrieved 19 August 2011. ^ Taylor, Jerome (19 June 2010). "Europe's finest join up for 'War Horse'". The Independent. London. Retrieved 27 February 2011. ^ Haun, Harry (15 April 2010). "PLAYBILL ON OPENING NIGHT: War Horse — The Neighs Have It". Playbill.com. Archived from the original on 24 May 2011. Retrieved 9 May 2011. ^ "Robert Emms". Curtis Brown Literary and Talent Agency. Retrieved 9 May 2011. ^ a b Grundy, Eddie (26 July 2010). "Spielburg on Dartmoor? I join 1000+ hopefuls for extras casting". Okehampton People. Okehampton. Archived from the original on 14 March 2012. Retrieved 27 February 2011. ^ Bloxham, Andy (4 December 2011). "War Horse author Michael Morpurgo's chance meet with granddaughter of story's inspiration". Daily Telegraph. London. Retrieved 4 December 2011. ^ a b Powlson, Nigel (8 October 2010). "From West End to Hollywood as John's songs woo Spielberg". Derby Telegraph. Derby. Retrieved 15 March 2011. ^ Wadham, Jo (28 February 2011). "Interview with author Michael Morpurgo". The National. Abu Dhabi. Retrieved 15 March 2011. ^ Lezzeri, Theo (5 October 2010). "War Horse (Account of a schoolboy extra)". St Wilfrid's School. Archived from the original on 18 March 2016. Retrieved 2 April 2011. ^ a b c Williams, Matthew (16 October 2010). "On the hunt for Spielberg's War Horse in Surrey ..." Surrey Life. Surrey. Archived from the original on 9 March 2011. Retrieved 27 February 2011. ^ Schaefer, Stephen (30 December 2011). "Spielberg on 'War Horse'". Boston Herald. Boston, US. Retrieved 5 January 2012. ^ Armytage, Marcus (6 September 2010). "Jockeys jump at the chance to help Spielberg". The Daily Telegraph. London. Retrieved 20 September 2010. ^ Nichols, Tristan (3 August 2010). "Steven Spielberg starts filming War Horse on Dartmoor". The Herald. Plymouth. Archived from the original on 25 April 2011. Retrieved 20 September 2010. ^ "Steven Spielberg arrives in Devon to film new movie War Horse". Small World News Service. 3 August 2010. Archived from the original on 8 December 2011. Retrieved 17 June 2011. ^ Weintraub, Steve (24 December 2010). "Producer Kathleen Kennedy Talks WAR HORSE, JURASSIC PARK 4, the TINTIN Sequel, LINCOLN, ROBOPOCALYPSE, and a Lot More". Collider.com. Retrieved 26 December 2010. ^ a b "Experience the War Horse landscape in Dartmoor National Park". Dartmoor National Park Authority. 10 January 2012. Retrieved 16 January 2012. ^ Pearcy, Emma (6 August 2010). "The day Steven Spielberg came to see our piglets". Herald Express. Torquay. Archived from the original on 9 August 2010. Retrieved 20 September 2010. ^ "Dartmoor News: War Horse at Ditsworthy". Dartmoor News Magazine. Archived from the original on 14 August 2011. Retrieved 30 March 2011. ^ "Plymouth Ramblers: Pictures and Maps from some of our walks". Plymouth Ramblers. Retrieved 30 March 2011. ^ "Spielberg film War Horse moves Marines' Dartmoor march". BBC News Online. 11 September 2010. Retrieved 11 September 2010. ^ Staff writer (27 October 2010). "Steven Spielberg praises 'abundance of natural beauty' in Dartmoor". The Daily Telegraph. London. Retrieved 23 November 2010. ^ Tapley, Kristopher (27 November 2011). "Thanks to 'War Horse' and 'We Bought a Zoo,' it's high times for Dartmoor Two holiday films draw ties to South England's protected moorland". Hitfix.com. Retrieved 2 December 2011. ^ "Spielberg film War Horse closes Castle Combe". BBC News Online. 17 September 2010. Retrieved 20 September 2010. ^ Staff writer (14 August 2010). "Spielberg to shoot in Castle Combe". Wiltshire Times. Trowbridge. Retrieved 17 August 2010. ^ "Steven Spielberg's War Horse begins filming in Castle Combe". BBC News Online. 21 September 2010. Retrieved 21 September 2010. ^ "Close encounters of a Spielberg Kind - On the set of War Horse Movie in Castle Combe Wiltshire". YouTube. 27 November 2011. Retrieved 28 November 2011. ^ Staff writer (28 September 2010). "Villagers up in arms over Steven Spielberg film". The Daily Express. London. Retrieved 27 February 2011. ^ Jones-Berry, Stephanie (1 October 2010). "Spielberg's War Horse shooting at Wisley Airfield". Get Surrey. Retrieved 5 October 2010. ^ a b Stephenson, Hannah (18 December 2010). "Dramatic finale for Morpurgo". The Press and Journal. Retrieved 27 February 2011. ^ "Leaving Spielberg's "Warhorse" Film Location". 18 October 2010. Retrieved 8 May 2011. ^ a b Williams, Matthew (January 2011). "Surrey Film Locations: War Horse". Surrey Life. Surrey. Archived from the original on 26 December 2010. Retrieved 15 March 2011. ^ "War Horse filming". YouTube. 23 October 2010. Retrieved 27 February 2011. ^ "Steven Spielberg directs latest film at Luton Hoo". BBC News Online. 14 October 2010. Retrieved 25 October 2010. ^ "Walt Disney Pictures feature film 'War Horse' casting background in United Kingdom". featurefilmcasting.com. August 2010. Archived from the original on 2 January 2013. Retrieved 15 March 2011. ^ a b "Steven Spielberg has left the building". Twickenham Film Studios. 11 November 2010. Archived from the original on 17 July 2011. Retrieved 27 February 2011. ^ Bamigboye, Baz (5 November 2010). "Gary Oldman talks about laying Alec Guinness's ghost to rest in new film". Daily Mail. London. Retrieved 23 November 2010. ^ a b Edwards, Mike. "Interview: Emily Watson". Movie Vortex. Retrieved 1 April 2011. ^ Mottram, James (25 March 2011). "Emily Watson – A woman of substance who's still making waves". The Independent. London. Retrieved 25 March 2011. ^ Calhoun, Dave. "The triumphant return of Peter Mullan". Time Out. London. Retrieved 15 June 2011. ^ "Peter Mullan's Neds wins film awards". BBC. London. 26 September 2010. Retrieved 15 June 2011. ^ a b c Larson, Erica (18 November 2011). "Movie Magic, Makeup, and Horse Tricks Shape War Horse". The Horse. Retrieved 18 November 2011. ^ a b Moyes, Jojo (12 July 2011). "Horses groomed for Hollywood stardom". Daily Telegraph. London. Retrieved 12 July 2011. ^ Owens, Barb (1 December 2010). "Ellensburg man trains horses for Hollywood movies". Daily Telegraph. London. Retrieved 19 August 2011. ^ "Under Her Spell". ABC. 10 November 2011. Retrieved 14 November 2011. ^ "Under Her Spell - Transcript". ABC. 10 November 2011. Retrieved 14 November 2011. ^ Bamigboye, Baz (2 December 2011). "As he prepares for the release of his latest epic, War Horse, Steven Spielberg reveals why he gave the lead to an unknown". Daily Mail. London. Retrieved 2 December 2011. ^ Spinner, Karen (17 July 2011). "Artist scores job on the set of War Horse film". Horse and Hound. London. Archived from the original on 10 December 2012. Retrieved 29 July 2011. ^ Gardner, David (17 December 2011). "War Horse superstar: The Mail tracks down the unsung star of Spielberg's blockbuster—and the Hollywood 'horse whisperer' with whom he has an almost telepathic bond". Daily Mail. London. Retrieved 22 December 2011. ^ a b "Movie Review: War Horse". American Humane Association. Retrieved 22 December 2011. ^ "Casey vs. the American Humane Association , et al" (PDF). Hollywood Reporter. Retrieved 26 April 2014. ^ Solon, Olivia. "Inside the animatronic 'War Horse' used in grisly trench scenes". Wired UK. Retrieved 21 December 2014. ^ a b Poland, David (16 February 2011). "DP/30 Industry Legends: editor Michael Kahn". Movie City News. Retrieved 9 March 2011. ^ Tonguette, Peter. "Steven Spielberg: A Biography second edition by Joseph McBride". Sense of Cinema. Retrieved 23 June 2011. ^ Awalt, Steven (27 October 2011). "Steven Spielberg on Digital Editing". Retrieved 30 October 2011. ^ Sousa, B. R. (4 May 2011). "Interview: Jim Self". Sousa Central. Retrieved 5 February 2012. ^ Hartley, Emma (12 August 2011). "John Tams at Cropredy on Steven Spielberg and Richard Curtis". Emma Hartley's Glamour Cave. Retrieved 20 August 2011. ^ "War Horse (2011)". JWfan.com. Retrieved 28 October 2011. ^ "John Williams's War Horse Premiere". WQXR’s "Movies on the Radio. 22 October 2011. Retrieved 28 October 2011. ^ Clark, Nick (29 March 2011). "Sir William Sargent: Meet the mane man of film special effects". The Independent. London. Retrieved 22 April 2011. ^ de Semlyen, Phil (29 March 2011). "Exclusive: Tom Hiddleston On War Horse 'This isn't Saving Private Joey'". Empire. London. Retrieved 10 May 2011. ^ "John Williams: The Last Movie Maestro". The Wall Street Journal. December 17, 2011. Retrieved July 11, 2016. ^ a b c "War Horse: Production Notes" (PDF). DreamWorks Pictures. Retrieved July 21, 2016. ^ Staff writer (17 February 2010). "The Big 2011 Preview: All the films that matter in the next 12 months". Empire. Retrieved 27 February 2011. ^ Galloway, Stephen (December 2, 2011). "'War Horse': The Making of Steven Spielberg's WWI Epic". The Hollywood Reporter. Retrieved 18 August 2018. ^ Breznican, Anthony (28 September 2010). "Release dates moved up for 'Tintin,' 'War Horse,' and 'Mission: Impossible' 4". Entertainment Weekly. Los Angeles. Retrieved 29 September 2011. ^ a b McClintock, Pamela (13 October 2010). "DreamWorks' holiday 'War Horse'". Variety. Los Angeles. Retrieved 27 February 2011. ^ de Semlyen, Phil (4 March 2011). "Tom Hiddleston On War Horse: On Spielberg and his Great War epic". Empire. London. Retrieved 8 March 2011. ^ "Photos of JANUSZ KAMINSKI". Facebook. 28 October 2010. Retrieved 12 June 2011. ^ O'Hara, Helen (11 March 2011). "First Look At Spielberg's War Horse: Check out these new images". Empire. Retrieved 11 March 2011. ^ Hallett, Claire (16 March 2010). "A Week in the life of War Horse (or on the outskirts)". My Blog, Indi-pen.com. Archived from the original on 8 February 2012. Retrieved 5 May 2011. ^ McClintock, Pamela (29 March 2011). "DreamWorks Previews Steven Spielberg's 'War Horse,' 'Fright Night,' 'The Help,' 'Real Steel' at CinemaCon". The Hollywood Reporter. Los Angeles. Retrieved 30 March 2011. ^ "War Horse". War Horse official website. Retrieved 29 June 2011. ^ Child, Ben (29 June 2010). "War Horse trailer: is Spielberg's thoroughbred on track for an Oscar?". The Guardian. Retrieved 29 June 2011. ^ Plumb, Ali (14 August 2011). "Spielberg Introduces New War Horse Clip". Empire. Retrieved 19 August 2011. ^ O'Hara, Helen (4 October 2011). "New War Horse Trailer Online A fresh look at Spielberg's World War I". Empire. Retrieved 4 October 2011. ^ Heritage, Stuart (5 October 2011). "War Horse trailer: a stallion of Spielberg proportions: A Steven Spielberg movie thoroughbred with the sort of glorious casting that might just gallop off with an Oscar". The Guardian. Retrieved 5 October 2011. ^ Wales, George (18 November 2011). "New War Horse set pics arrive". Total Film. Retrieved 18 November 2011. ^ Elmhirst, Sophie (17 November 2011). "The man with the child in his eyes". New Statesman. Retrieved 17 November 2011. ^ Adams, Ryan (1 November 2011). "War Horse sneak preview screenings". AwardsDaily. Retrieved 1 November 2011. ^ "War Horse Movie Screening Tickets". Filmmetro.com. 1 November 2011. Retrieved 1 November 2011. ^ "Veterans invited to advance screening of Steven Spielberg's 'War Horse'". The Canadian Press. 10 November 2011. Retrieved 10 November 2011. ^ Stone, Sasha (27 November 2011). "Steven Spielberg War Horse Q&A". Awards Daily. Retrieved 28 November 2011. ^ Breznican, Anthony (22 November 2011). "Special 'War Horse' screenings set for Sunday". Entertainment Weekly. Retrieved 23 November 2011. ^ "Thundering Hooves". 24 November 2011. Archived from the original on 31 January 2012. Retrieved 25 November 2011. ^ "Behind the scenes on 'War Horse'". Horse & Country. 8 November 2011. Archived from the original on 9 November 2011. Retrieved 8 November 2011. ^ O'Connell, Sean (25 November 2011). ""War Horse" TV spots ahead of Sunday sneak peek – AWARDS ALLEY". Hollywood News.com. Retrieved 28 November 2011. ^ Ford, Allan (27 November 2011). "Seven WAR HORSE TV Spots". Hollywood News.com. Retrieved 28 November 2011. ^ Vary, Adam B. (1 December 2011). "'War Horse' TV spot: The cast sells Spielberg's 'emotional journey'". Entertainment Weekly. Retrieved 2 December 2011. ^ Puente, Maria (22 December 2011). "Will and Kate to come out for 'War Horse'". USA Today. Retrieved 22 December 2011. ^ "War Horse by Steven Spielberg". Harper Collins Publishers. Retrieved 22 December 2011. ^ Malone, Toby; Jackman, Christopher J. (2016). Adapting 'War Horse': Cognition, the Spectator, and a Sense of Play. London: Palgrave Macmillan. pp. 14–15. ISBN 978-1-137-59474-7. ^ Schaaf, Chris. "War Horse Gallops onto Blu-ray". Technologytell. www.technologytell.com. Retrieved 23 March 2012. ^ Gallagher, Brian (21 February 2012). "War Horse Blu-ray and DVD Arrive April 3rd". MovieWeb. Retrieved 23 February 2012. ^ Poland, David (25 November 2011). "War Horse (Spoiler-Free)". Movie City News. Retrieved 27 November 2011. ^ Marino, Joe (26 November 2011). "War Horse: film review". The Daily Telegraph. Retrieved 27 November 2011. ^ "Lisa Schwarzbaum's review of "War Horse"". Retrieved 21 June 2012. ^ Tookey, Christopher (2 December 2011). "Hankies at the ready for Steven Spielberg's finest hour". The Daily Mail. Retrieved 3 December 2011. ^ "This War Horse is Not Just a War Horse". Retrieved 20 June 2012. ^ Ebert, Roger (21 December 2011). "War Horse". The Daily Mail. Retrieved 22 December 2011. ^ "Richard Roeper's review of "War Horse"". Retrieved 20 June 2012. ^ "Classic Hollywood rides again: Spielberg packs 'War Horse' full of nostalgia". Retrieved 21 June 2012. ^ Corliss, Richard (7 December 2011). "The Top 10 Everything of 2011 - War Horse". Time. Retrieved 13 December 2011. ^ Winder, Simon (9 February 2012). "Keeping Up with the Germans by Philip Oltermann". The Guardian. Retrieved 9 February 2012. ^ David Denby. (2 January 2012). Battle Stations The New Yorker. Retrieved 30 January 2014. ^ The Sammy Awards American Music Preservation. Retrieved 30 January 2014. ^ "84th Academy Awards Nominations List". Academy of Motion Picture Arts and Science. 24 January 2012. Retrieved 24 January 2012. ^ "Nominees & Recipients". American Cinema Editors. Archived from the original on 22 March 2012. Retrieved 17 January 2012. ^ "2011 AFI Awards Announced". American Film Institute. 11 December 2011. Retrieved 12 December 2011. ^ "BAFTA Film Awards Nominations in 2012". British Academy of Film and Television Arts. 17 January 2012. Retrieved 17 January 2012. ^ Gallo, Phil (17 May 2012). "Backbeat: Rolfe Kent Receives Career Achievement Honor at BMI Film and TV Awards". Billboard. Prometheus Global Media. Retrieved 9 December 2012. ^ "Hugo and The Artist Lead BFCA Nominees". Awards Daily.com. 13 December 2011. Retrieved 13 December 2011. ^ "Central Ohio Film Critics Nominations". Awards Daily. 1 January 2011. Retrieved 2 January 2011. ^ "Tree of Life Leads CFCA Nominations with 7; Descendants, Drive Follow with 6". Chicago Film Critics Association. 16 December 2011. Retrieved 18 December 2011. ^ a b "The 69th Annual Golden Globe Awards NOMINATIONS". Golden Globe Award. 15 December 2011. Archived from the original on 29 October 2012. Retrieved 15 December 2011. ^ "Home". Houston Film Critics Society. Retrieved 11 December 2011. ^ "Houston Film Critics Society Nominees". Awards Daily.com. 10 December 2011. Retrieved 11 December 2011. ^ "Drive & Tinker Tailor Soldier Spy lead London Critics' Circle Film Awards nominations". Awards Daily. 20 December 2011. Retrieved 20 December 2011. ^ "2012 Golden Reel Award Nominees: Feature Films". Retrieved 29 February 2012. ^ "Awards for 2011". National Board of Review of Motion Pictures. Archived from the original on 12 June 2010. Retrieved 4 December 2011. ^ "2012 Producers Guild Nominees!". Awards Daily. 3 January 2012. Retrieved 5 January 2012. ^ "2011 International Press Academy Satellite Award Nominees". Satellite Awards. Retrieved 2 December 2011. ^ "Southeastern Film Critics Association Awards". Awards Daily.com. 19 December 2011. Retrieved 19 December 2011. ^ "The 2011 WAFCA Awards". Washington D.C. Area Film Critics Association. Retrieved 4 December 2011.